The Samsung S9 Series flagship smartphones: A Run-of-the-Mill Upgrade? The new Samsung S9 & S9+ are here. Not that there was a huge build up for these models anyway…so yay!? A lot has been written about these phones , speculation and speciﬁcation wise. For that reason I am not going into that area at all. What I do want to talk about, is the actual “New” and “Upgraded” stuff from the Samsung S8/8+. Speaking of S8, those of you who just bought one of the S8 variant/s, we say, you’re not missing on anything. There is a new Snapdragon 845 chipset in the S9/9+, but the older chipset (being a Snapdragon 835) is quite adequate and will continue to do so for the next ﬁve years, simply because the infrastructure India is just that great (*cough* sarcasm *cough*). Or realistically, its just the camera set up that is slightly better than the S8 & S8+. So how big is the slightly in that “slightly improved camera”? Here is whats new in Samsung S9. The S9 sports a 12 MP with f/1.5-2.4, 26mm, 1/2.5″, 1.4 µm, Dual Pixel PDAF, single unit which is optically stabilised with the all new variable aperture. The smart phones available in the marketplace have ﬁxed aperture in the tiny cameras that they sport. Hence, when the South Koreans came up with the variable aperture, it naturally peaked interests. You can actually see the variable aperture in action, albeit, if its just the seeing part, kindly log on to Youtube. The S9+ camera, has Dual12MP with primary being a f/1.5-2.4, 26mm, 1/2.55″, 1.4 µm, Dual Pixel PDAF and the secondary running on f/2.4, 52mm, 1/3.6″, 1 µm, AF set up. 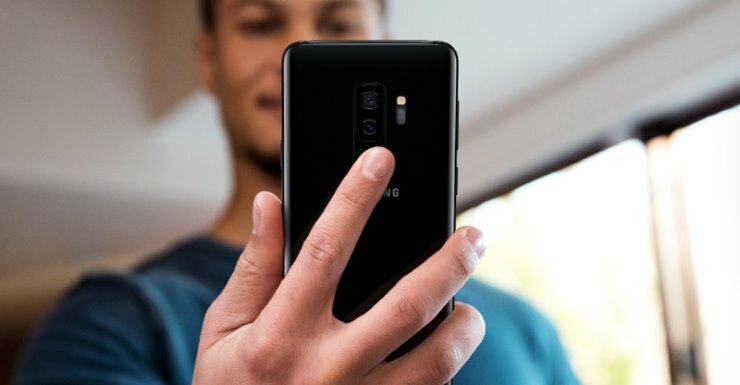 What this means is the S9+’s secondary camera is a telephoto lens with f/2.4. That is impressive. And if you read carefully, the primary lens on both these models gives you a dynamic range of f/1.5-2.4. All the cameras in the market are placed within the range of f/1.8 – f/2.0 ﬁxed aperture. but that is where the Samsung S9 series outshines all of these. And that is really something, because when we type “dynamic range,” its usually when we are reviewing cameras and NOT smart phones. And its not just the camera hardware that has improved, the software get goodie upgrades too. The S9 series comes armed with improved composite HDR mode with a capacity to shoot 12fps which means the camera reduces a lot of noise in low light HDR mode. Also new to the software is the Super Slow Mo option, which you ﬁnd in the setting of Pro Mode. There are two options in the Super SlowMo; 1080p @ 240 fps and 720p @ 960 fps. Yes…let that sink in for a moment. The result of this is that if you mount this phone on a tripod or a steady cam rig, and shoot it for 0.2 seconds, you get an end result footage of 6.0 seconds. *Mind Blown* With some amount of creative understanding, some steadiness in hands and the 720p @ 960fps, you can get cinematic results to upload on your Insta Stories. And that right there is why all the money spent on this piece of expensive device is justiﬁed. Super good Insta stories. And I could just end this piece right here. But there are a few more upgrades that this device packs in. In another use of the new camera you get the Bixby Vision, which is still not as good or reﬁned as Google Cam, but we hope its getting there. The updated Bixby Vision gives you options to play with. There are QR Code Scanner, Geo Tagging, Shopping Assist, but the two relevant uses of the new Bixby are Signage translator run on the Google Translator and Make Up by Bixby. With the new translator, you can translate written word on the pictures you take, which means you can get by if you are stranded in a foreign country. And the way Makeup by Bixby works is you can take a picture of yourself and artiﬁcially put make up on that picture , choose the look you want for yourself and when you ﬁnalise the look, Bixby Vision will tell you what products to physically use and where to buy them. and security. So turns out the slightly is not at all slightly. Revolutionary new camera stuff… this S9/ S9+. The display is Quad HD, super AMOLED (2960×1440) with 570ppi pixel density in S9 and 529ppi pixel density in the S9+. The colour options available are Lilac Purple, Midnight Black, Titanium Grey and Coral Blue. The colours have names because it should get you to feel as if you are buying a car. On a side note, with the phone prices ranging from INR. 57900/- to INR. 72900/- , your grand dad probably spent the same money on buying an actual car, some twenty odd years ago. To sum it up, the S9/9+ are great phones. Probably these phones will be one of the top three best rated phones at the end of this year. And they should be, with the punch they pack. But I will still buy the Pixel or Pixel XL over a Samsung, any Samsung.